Summer’s just started, but we’ve already got a TON of big things happening at Dos Coyotes. And nothing’s bigger than the finale of our “Kinda Annual, Semi-Occasional Poster Contest!” There are some incredible entries and, as you’ll see below, for the first time you get to help us decide the winners. The newsletter also features my new favorite seasonal special (I know, I know… I said that in the spring newsletter, too) — WIle E.’s Rocket Taco Plate — and a sneak preview of our new partnership with Yep Roc Records that will put some great new tunes on your summer playlist. As always, we hope you enjoy the newsletter (let me know what you think! ), and be sure to tell your family, friends and table-mates to sign-up to for their own copy. Whose Poster Shall Reign Supreme? With all the poster entries officially received, on June 7 we launch the fan voting phase of our popular “Kinda Annual, Semi-Occasional Poster Contest.” Fans can check out the amazing art (and vote for the “Fan Favorite” poster winner) on the Dos Coyotes Facebook page. The posters are incredible this year. We’ve got a few favorites, but are excited to see what the Dos fans think. Fan voting ends Friday, June 21, 2013, and five randomly selected voters will each win a $25 Dos Coyotes gift card. The “Fan Favorite” winners (high school student and adult) will receive Dos Coyotes gift cards valued at $100 for 1st place, $75 for 2nd place and $50 for 3rd place. In addition, the “Best of Show” winners, judged by Dos Coyotes staff and a team of local art experts, will receive Dos Coyotes gift cards valued at $500 for 1st place, $250 for 2nd place and $100 for 3rd place. The student who wins “Best of Show” in the high school division will also receive a $500 donation for his or her school art department. After the contest, look for the top entries in the restaurants, on our website and employee T-shirts. We’re offering more than $2,500 in prizes this year, so there’s a lot at stake. Vote today! Winners will be announced by June 30th, 2013. Read the official rules. This issue’s seasonal special is guaranteed to make you howl — Wile E.’s Rocket Taco Plate. 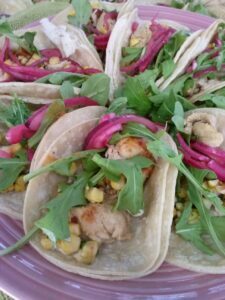 Three fajita-style chicken tacos with fresh roasted corn salsa, chipotle cream, citrus and onions on corn tortillas. I know what you’re thinking: “Wow, that sounds great, but where’s the ‘Rocket’?” Arugula (also known as salad rocket). This peppery leafy green is an incredible alternative to lettuce. It adds character and a spicy note that elevates these incredible chicken tacos to the next level. And because we’re over-the-top people when it comes to cuisine, we’ve also kicked in a blast of habanero salsa. So come and get it! While arugula is an annual vegetable, we’re only serving Wile E.’s Rocket Taco Plate for a limited time. Summer wouldn’t be the same without fresh, sweet corn. To celebrate, we’ve added a few seasonal sides to the menu: Antonio’s World Famous Corn Salsa, our Roasted Corn Guacamole, and, of course, Dos Coyote’s highly anticipated Roasted Corn-on-the-Cob. Served with a tangy chili lime butter, your palate will be blown away. Bobby Coyote has always loved music (one of his first jobs was as a laser light technician for the band War!). So it came as no surprise to the staff at Dos Coyotes Headquarters when he came out of his office and announced he’d signed a partnership with innovative indie label Yep Roc Records. We’re still working out all the details and are excited about what the deal means to Dos Coyotes’ fans. We’re thinking free song downloads and opportunities to meet amazing artists like Chuck Prophet and other Yep Roc bands, but stay tuned, more to come!